We’d love your help. Let us know what’s wrong with this preview of Woman In The Woods by Phillip Tomasso III. Some secrets will not stay buried. In 1912, a young girl is found murdered. In present day, Jeremy's parents are involved in a murder-suicide. Soon after, he is committed to an insane asylum. Years later, Jeremy turns eighteen and is released. After he returns home to live with his uncle, old memories begin to emerge. As people around him start to die in rapid succession, Jeremy slowly comes to terms with his parents' deaths. But what really happened that fateful night? To ask other readers questions about Woman In The Woods, please sign up. This is a great story that links past and present in a supernatural thriller. Jeremy just was released from an insane asylum thanks to help from his Uncle Jack. Jack is the only family Jeremy has because his mom and dad died years ago. As pictures of what truly happened to his parents in the past float around him, Jeremy is finding the present has problems of its' own. This is a well written tale that will have readers eagerly turning the pages. Woman in the Woods is loosely based on a local legend (Rochester, NY) that has been around since my parents were kids. Lady in White, or White Lady's Castle is what the tale was known by. The front face of a "castle" at Durand Beach faces Lake Ontario, on either side are stone steps and behind it nothing but woods. Growing up my parents' house was haunted. Inside "lived" a friendly ghost known as Jenny. I stopped sleeping in my own bedroom at the age of thirteen or fourteen. Even when I returned Woman in the Woods is loosely based on a local legend (Rochester, NY) that has been around since my parents were kids. Lady in White, or White Lady's Castle is what the tale was known by. The front face of a "castle" at Durand Beach faces Lake Ontario, on either side are stone steps and behind it nothing but woods. Growing up my parents' house was haunted. Inside "lived" a friendly ghost known as Jenny. I stopped sleeping in my own bedroom at the age of thirteen or fourteen. Even when I returned home from college I slept on the sofa in the family room. I dedicated this book to Jenny. I suppose I should also have dedicated it to the Lady in White. I hope you enjoy the mystery as it unfolds! So first off, the book's description is actually misleading. (view spoiler)[No one around Jeremy dies. There is a kidnapping towards the end but she is rescued. All the dying happens in the 1912 flashbacks involving the original Sheriff O'Sullivan. (hide spoiler)] I was expecting more of a thriller, not simply a ghost story. There is also very little sense of setting, something I noticed especially since I have lived in Old Forge and Inlet, near where the book takes place (Old Forge is mentioned So first off, the book's description is actually misleading. (view spoiler)[No one around Jeremy dies. There is a kidnapping towards the end but she is rescued. All the dying happens in the 1912 flashbacks involving the original Sheriff O'Sullivan. (hide spoiler)] I was expecting more of a thriller, not simply a ghost story. There is also very little sense of setting, something I noticed especially since I have lived in Old Forge and Inlet, near where the book takes place (Old Forge is mentioned several times). You would think the Adirondack wilderness would make an excellent backdrop to a tale of revenge and the supernatural, in a "setting as character" manner. Lastly, there was no closure with regards to (view spoiler)[Kevin. He was built up as a villain until his dad got killed and implicated in some very serious crimes and yet we never hear from Kevin again (hide spoiler)]. All in all Woman in the Woods felt more like a first draft just getting the plot down, rather than a fully realized novel. This book freaked me out a bit. I was so drawn into the story I had to sleep with my lights on. Looking forward to the next one! 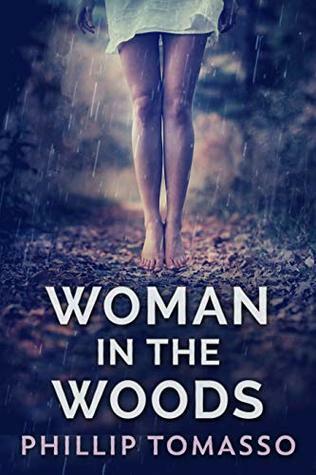 "Woman in the Woods" by Phillip Tomasso is a real page-turner! The story begins in 1912, then skips to the present. That pattern continues throughout the book, adding to the intrigue and suspense. Although I don't normally read ghost/paranormal mysteries, I'm glad I made an exception. I literally read this in less then 8 hours. I think this is the best book so far written by Philip Tomasso! I hope everyone takes the time to read it. Well done sir, well done. This book follows two story lines in parallel: the murder and investigation of Elissa's thirteen year old daughter in 1912, and the present day return home of Jeremy to the care of his uncle from a mental institution following his eighteenth birthday. Jeremy is living in the house that belonged to his murdered parents and starts to feel that the house is haunted. Strange things are happening, things that seem to have a connection to the past, which makes him explore the history and draws the two This book follows two story lines in parallel: the murder and investigation of Elissa's thirteen year old daughter in 1912, and the present day return home of Jeremy to the care of his uncle from a mental institution following his eighteenth birthday. Jeremy is living in the house that belonged to his murdered parents and starts to feel that the house is haunted. Strange things are happening, things that seem to have a connection to the past, which makes him explore the history and draws the two storylines together to an exciting conclusion. All the characters were great, some nice and some not! The character of Uncle Jack was particularly likeable. The author did a great job in relating what was going through Jeremy's mind, especially all the self doubts as to his own sanity and ability to cope outside of the institution. I really enjoyed this book. It is a good creepy story and I loved the ending! Totally enjoyed this novella which slips between the events of 1912 and the present. When a young girl is raped and murdered in the early years of the 20th century, no one could predict that her death would continue to have repercussions that still reverberate in the present. Having witnessed the deaths of his parents in a murder/suicide at the age of eight, Jeremy becomes a disturbed child and we meet him at the age of 17 as he is released from the psychiatric hospital where he has been treated for almost ten years. Jeremy moves into the old family home where he lives with his Uncle Jack finds a job and his life seems to be on the up. Enthralled from start to finish! Tomasso never fails. He knows how to write horror and suspense with an eye for what will make readers squirm. His latest novella, Woman in the Woods delivers no different. I found myself unable to read this story in bed at night. The darkness seemed too alive. So after reading in the daylight, I still found myself suspensefully swiping Kindle pages to find out who did what and why. The story follows two story lines, Elissa and the loss of her 13 year old daughter Enthralled from start to finish! Tomasso never fails. He knows how to write horror and suspense with an eye for what will make readers squirm. His latest novella, Woman in the Woods delivers no different. I found myself unable to read this story in bed at night. The darkness seemed too alive. So after reading in the daylight, I still found myself suspensefully swiping Kindle pages to find out who did what and why. The story follows two story lines, Elissa and the loss of her 13 year old daughter to a murderer(s?) and Jeremy after his release from a mental institution back to his childhood home. The stories converge around the home Jeremy is left in a will by his murdered parents. He returns to this home with his Uncle to find that it is haunted. Jeremy finds himself in a fight for his sanity in the home and soon comes to realize there's a story that he needs to follow in order to fully right everything in his world. Tomasso delivers exquisite writing that I've come to expect and won't disappoint readers who love a good ghost story. Raging Book Reviews Highly Recommended! Awesome read that keeps you on your toes and guessing! Reads smooth inbetween the time lines and it links it all together. ADVERSE IMPACT: Winner, 1st Place Bloody Dagge Phillip Tomasso III is the award-winning author of many novels, including the Severed Empire series, and Amazon Best Selling Vaccination Trilogy.